Will the real J. S. Bach please stand up? This weekend the Portland Baroque Orchestra, led by Monica Huggett, artistic director & violin, performed the Goldberg Variations as arranged for strings by Dmitry Sitkovetsky. I went to the Sunday show at Reed College’s Kaul Auditorium. There are many philosophical questions that are suggested by the idea of historically informed performance, and several books have been written examining these questions. While this may sound like an arcane exercise, it is in fact eminently practical, as the views on these questions issue in particular performance practices, and there are strong feelings on all sides of the question. When the historically informed performance movement was still young it was criticized quite sharply by many members of the musical community, though it has since made a respected place for itself. Before the historically informed performance movement, no one raised an eyebrow when contemporary instruments were used in the performance of period music. In fact, the most famous twentieth century performance of the Goldberg Variations was by Glenn Gould, who recorded them twice, once as a young man and again later as an older man. Glenn Gould’s Goldbergs were performed on a piano, and so striking is Gould’s artistry that he can make a piece written for the harpsichord sound as though it were always intended for the piano. Lesser artists attempting to perform period harpsichord music on a piano have not been so successful, but Gould’s attempt is a triumph and I never tire of listening to it. But is it Bach? Is it what Bach intended? Do Bach’s intentions matter? For the performance artist whose works are preserved and become part of the regular repertory of performance, it could be argued that an the artist expects, hopes for, continuing reinterpretations so that the music (or dance, or theater, or whatever) will continue to be interpreted afresh and to speak directly to contemporary audiences. It is likely that the definitive performance of any given work will not occur until long after the artist dies, and the work finally finds its inspired interpreter. It could be argued that Glenn Gould’s performance (one of recordings, at least) was the definitive performance of the Goldberg Variations — or, if not the definitive performance, at least a definitive performance. When I listened to the Portland Baroque Orchestra perform the Goldberg Variations I could always hear Glenn Gould in the background, because this is the performance tradition that for me is normative. With a PBO performance of the Goldberg Variations arranged for string orchestra we have a period piece performed on period instruments; Bach would not have hesitated to recognize this work of his as being his. Bach would have “owned” it. Nevertheless, it is not exactly the work that Bach wrote. He wrote it for a harpsichord; it was another hand that transcribed it for string orchestra. Which is the more authentic performance, the piano rendition of the score as Bach wrote it, performed on an instrument Bach himself never played, or the historically informed performance using period instruments with which Bach himself was intimately familiar, but using a score that is not Bach’s? It would be easy to dismiss musical authenticity as a will-o-the-wisp, and, as I mentioned above, this is how the movement was initially received, but mere dismissal is not satisfying. It is a natural question to ask oneself, “How would this have sounded in Bach’s day?” One can simply maintain that the question is unanswerable, but to to so is to dismiss the work of many scholars who have devoted lifetimes to the recovery of the baroque performance tradition. While we are not here talking about science, it is impossible not to note that this disavowal of the very possibility of knowledge is contrary to the spirit of science, and therefore contrary to the spirit of the age. There is a kind of epistemological nihilism in saying, “We can never know,” especially when this avowal is followed by a repudiation of any attempt to know. And once the attempt to know is recognized to be legitimate, the impulse is there is try to close the gap of knowledge and get as close as possible to the original. While the gap will always remain, there is no reason that it cannot be reduced, perhaps to insignificance. It was a real treat to hear two twentieth century quartets performed live by a vital ensemble that really invested a feeling of liveliness into music that, if we paused to reflect on the popular reputation of art music of the twentieth century, ought to be academic and distant. This music, given a sensitive and comprehending performance, reveals itself as poignant and as direct as that of any genre or any age. Barber’s quartet is best known for the second movement, which Barber himself also separately arranged as the Adagio for Strings for chamber orchestra. During a pause in the second movement, when the entire hall was as still as a tomb, I heard a woman behind me quietly say, “Amazing!” And it was amazing. Listening to the Jasper Quartet perform the piece by Barber, and mindful of the reputation of twentieth century art music (as mentioned above), I was reminded of another aesthetic experience earlier in my life. 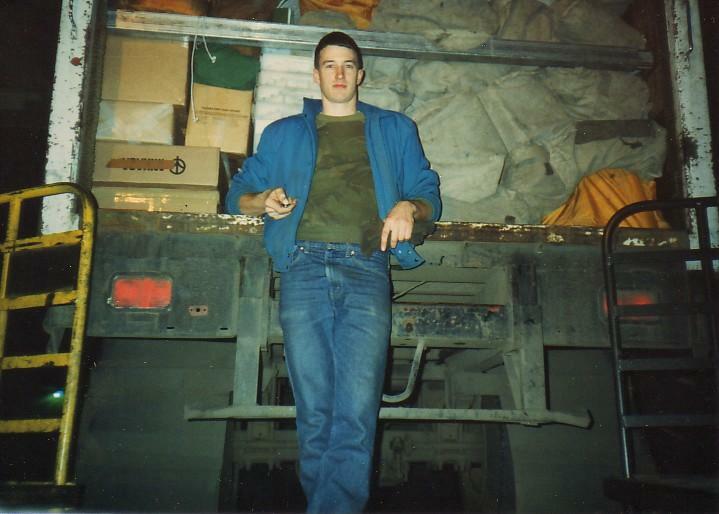 When I was in Frankfurt in 1991 I visited an art museum focused on modern art. This museum no longer exists in the form that I saw it, since it has since been moved to a new building and has expanded its collection. What struck me about these modern paintings I saw in Frankfurt was really how unmodern they were — that is to say, how traditional they were, how steeped they were, how deeply immersed they were, in the tradition of European painting. If you see paintings like this in a book of art hsitory, you see what looks like a field of plain color, or some such abstract form. Up close, they were nothing like this at all. The seemingly plain fields of color were textured and infinitely varied in detail. Barber’s quartet struck me in a similar way: while recognizably “modern,” it is deeply immersed in the traditions of Western music, and it projects a texture that speaks of the long history of which it is a particular expression. An aesthetic experience such as I had in Frankfurt put me on notice relatively early in my life of the importance of seeing works of art with one’s own eyes and not relying too heavily on reproductions, however good the quality of the reproduction. Similar concerns hold for music: it is important to see and to hear music performed if one is going to arrive at a proper appreciation of it. The second work performed, Kernis String Quartet No. 1, “musica celestis,” dates from fifty years after the Barber quartet, and is the work of a living contemporary. Sam Quintal of the quartet gave a short talk about the piece before they commenced its performance, having the violins and the cello perform bits of the melody so that the audience could listen for these recognizable parts in what turned out to be a highly compressed and dense musical texture. Mr. Quintal prepared the audience for the complexity and difficulty of this work, but to use these words doesn’t nearly come close to doing the work justice. If you speak of “difficult” art music someone might think of Shostakovitch, and if you speak of “complex” art music someone might think of, say, Elliott Carter or Brian Ferneyhough. Mentioning Shostakovitch reminds me of an anecdote. I once heard an interview with a performer in a string quartet, and this performer talked about the feeling of tension that built while performing works of Shostakovitch, and that after performing the Shostakovitch that they would follow it with Ravel’s quartet, which in this context had a feeling of release, relief, and catharsis. Well, the Kernis string quartet had much more in common with the vital and breezy quality of Ravel than with the plethora of notes one might expect from, say, Elliott Carter. And while its complexity rivaled the “new complexity” of Brian Ferneyhough, it was never complexity for complexity’s sake: every note of the music was musically justified. One could even say that every note was lyrically justified, because the work was extraordinarily lyrical. I had never even heard of Kernis prior to this performance, but this quartet was a fantastic piece, and certainly something that is likely to become a fixture of future quartet repertoire — and all to the good, I say. While it looked fiendishly difficult to play, it was a great joy to hear. It was deeply satisfying to me to hear this performed live, as it is a piece of music that I know well, and the performers really leaned into it, giving the performance a striking physicality. Detail from the Low Ham mosaic, from a fourth-century AD Roman villa in Britain, depicting Dido and Aeneas embracing. First of all, I’m not an opera enthusiast. The nineteenth century Italian operas that dominate the repertoire don’t speak to me at all, and I consequently never listen to them. But some years ago I was watching a television documentary about music, and they included a performance of Dido’s Lament from Purcell’s early opera Dido and Aeneas. I was fascinated, and soon after bought a CD of the music. After than time I began listening to early modern operas, though I remain unmoved by the more popular manifestations of the genre. 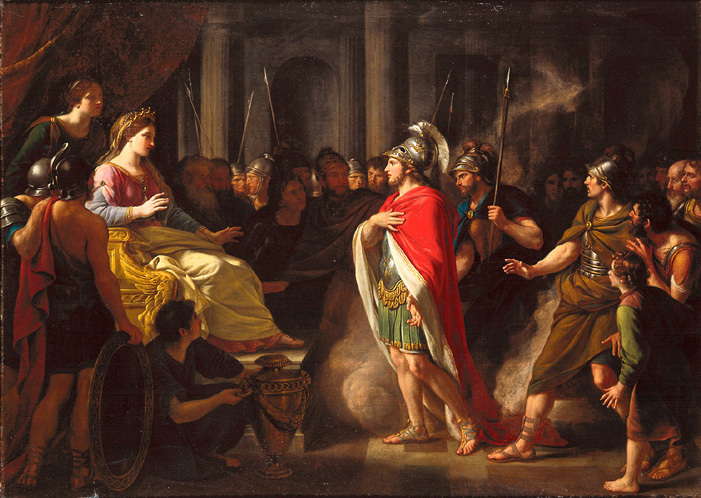 Dido and Aeneas remains my favorite opera music, so I was happy to see that this year’s Oregon Bach Festival would include a performance of Dido and Aeneas by the Portland Baroque Orchestra. 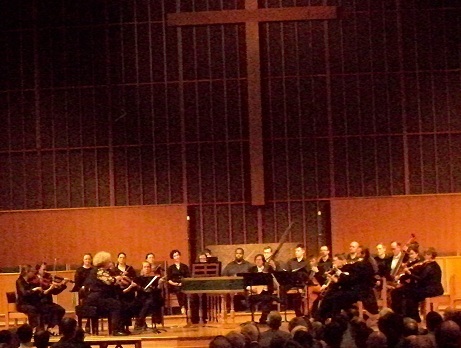 Last year for the Oregon Bach Festival the PBO performed all the the Brandenburg Concertos, which performance I attended and enjoyed immensely (and wrote about in Six concerts à plusieurs instruments). This year for the Oregon Bach Festival, the Portland Baroque Orchestra didn’t play any Bach at all, and half the program wasn’t even baroque. As though the program was arranged in dialectical subtlety, the program began with the instrumental Simply Symphony of Benjamin Britten (the thetic movement, if you will), followed by six A Capella Choral Dances from Britten’s Gloriana (the antithetic movement). Thus far the program was twentieth century, but the synthetic climax was Purcell’s Dido and Aeneas, for both instruments and voice. It could be considered a staple of performing arts mythology that the long-suffering understudy should get his or her great opportunity when the star billed for the big show is unable to perform. Only just days before Dido and Aeneas it was announced on the PBO website that the scheduled soprano Golda Schultz was “indisposed” and that her place would be taken by Leah Wool. Ms. Wool doesn’t seem to be a long-suffering understudy, but it was bold of her to step in at the last minute. While Dido’s Lament is my favorite part of Dido and Aeneas, I don’t think that that prejudiced my judgment, but I really think that this brief number was the strongest part of the entire show. Wool’s performance was not only the embodiment of technical perfection, but was an assured and confident performance. It is easy to imagine that aspiring opera singers practice these ‘greatest moments” arias, and so if they ever do get called in as their big chance to shine in the starring role, they probably know these pieces best. While I was watching the twentieth century portion of the show I was wondering, since the PBO is known as an early music ensemble that seeks to present historically informed performances, whether they were using their accustomed instruments, or if they had instead temporarily traded in their early instruments for period instruments from the mid-twentieth century. Returning from the show I read this on the PBO website: “Includes Benjamin Britten’s divine Choral Dances and Simple Symphony, which Monica [Huggett] has always wanted to play on gut strings.” This both answered my question and posed a whole new set of questions: what are we to call performances that employ historical instruments and technique for the performance of contemporary music? Tonight I listened to Stabat Mater again. It had been awhile. As soon as I finished listening to a 1987 performance by The King’s Consort conducted by Robert King I put on a 1993 recording by the Sinfonietta de Montreal conducted by Charles Dutoit. I suppose I should locate recordings of a few more performances so I could go on listening to Stabat Mater all night if I so chose to do so, and always in distinct interpretive iterations. I have my truck driving career to thank for my discovery of Pergolesi. 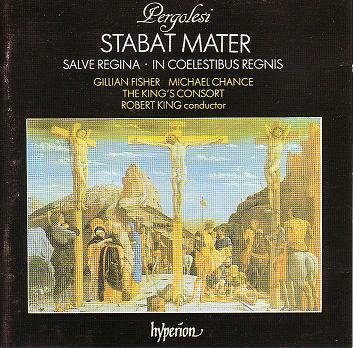 And so it is when I listen to Pergolesi’s Stabat Mater: I seem to myself to become a better philosopher. Listening to music as perfect as Stabat Mater is like cleansing the mind’s palate with the intellectual equivalent of lemon water between courses: everything else is thrown into sharper relief, perceived with greater clarity, understood with an otherwise unattainable acuity. Nothing is muddled; nothing languishes in obscurity. This kind of intellectual beatitude cannot, of course, endure for long. Like all things of this world, this too shall pass: Sic transit gloria mundi. The muddle returns, and darkness and obscurity begin to close in once again around the edges of the mind once illuminated by Truth and Beauty. But while the glory lasts, it is a glorious moment indeed, and Pergolesi gives us one of those moments. 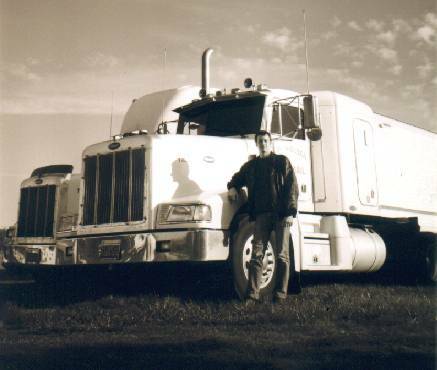 My years of truck driving shaped me intellectually as much as any influence in my life. Today, 12 November 2010, contemporary Polish composer Henryk Górecki passed away. Górecki will be remembered for his Symphony No. 3, Op. 36, also called the “Symphony of Sorrowful Songs.” I am listening to it as I write this. It does not open like a sorrowful song. With its long and gradual crescendo and soaring lyricism, it is anything but sorrowful. When the soprano begins, however, we hear the sorrow, but it is not a lament. And the orchestra continues its lyrical crescendo, relentlessly, if not restlessly. 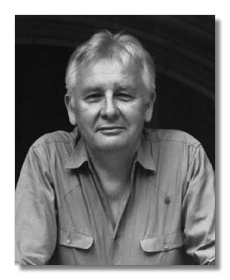 For a country that suffered as much as Poland during the twentieth century — and Górecki was present for much of this — one is not surprising to find a son of Poland writing a Symphony of Sorrowful Songs, but we should perhaps place more emphasis on songs than on sorrowful. 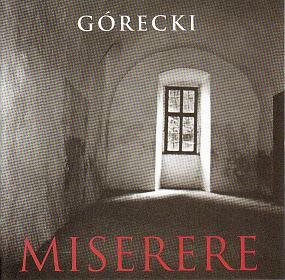 Górecki wrote a significant body of vocal music, including the Miserere, and there is a sense in which the vocal genre has influenced Górecki’s non-vocal works as well. I find this is Górecki’s quartets, No. 1 “Already It Is Dusk” and No. 2 “Quasi una Fantasia,” which possess a lyrical quality not unlike the third symphony. Simply to furnish some contrast, I listened to some of Elliott Carter’s quartets today, and it is difficult to hear any sense in which the two were contemporaries. Carter’s busy dissonance contrasts sharply with what has been called Górecki’s sacred minimalism. Certainly there are striking dissonances in the quartets, but it is a highly controlled dissonance. I am reminded here of Webern’s orchestral pieces, so succinct, so sententious, that some are not a minute in length, and I note that when Górecki was in his early modernist phase, it was Webern and not Schoenberg who was his primary influence. 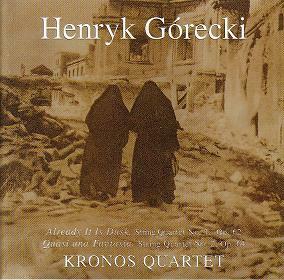 I also hear the faintest trace of Stravinsky (the early Stravinsky, the fantastical Stravinsky, and not the later neo-baroque Stravinsky) in Górecki’s quartets. 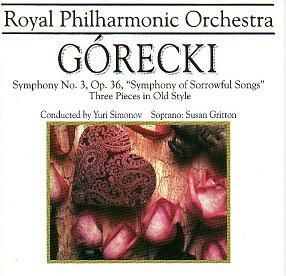 Górecki will be remembered for his third symphony not least because it was one of these rare pieces of contemporary art music that became a best selling CD. 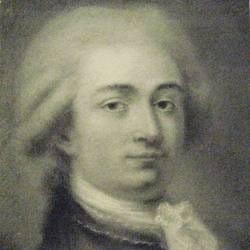 Because of his popular success with his third symphony, it is that much more likely that the remainder of his ouvre will receive the hearing that it deserves. 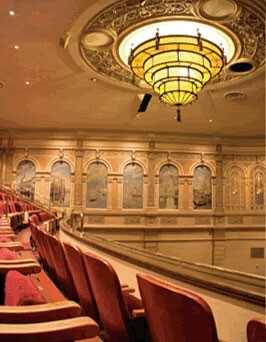 The faux Venetian splendor of the restored Liberty Theater in Astoria proved to be a great venue. The Astoria Music Festival is underway at present, and the offerings of recent years have significantly brought its program up to admirably high standards. 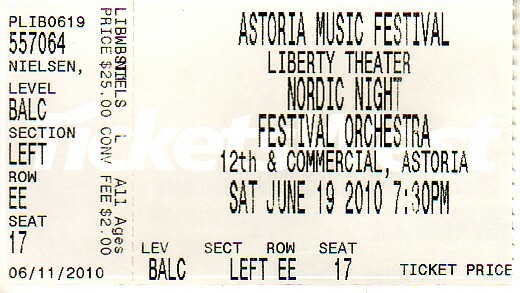 My mom bought a couple of tickets to tonight’s program titled “A Midsummer Nordic Night” and I attended the performance with her in Astoria this evening. Unfortunately since my camera was recently stolen I was unable to take any pictures this evening. 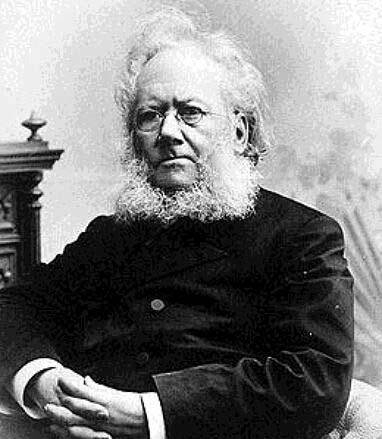 Henrik Ibsen, author of the dramatic prose poem Peer Gynt. Almost exactly a year ago I attended the Portland Baroque Orchestra’s performance of the complete Brandenburg Concertos, and it was an enjoyable experience to hear music performed live that I knew so well. Similarly, this evening, it was a pleasure to hear Grieg’s music for Peer Gynt performed live. And more than the music, there was a narrator (David Ogden Stiers) who read parts of the story to link together the musical performances, and several of the musical performances included performances by dancers. So while this wasn’t a full production of Ibsen’s Peer Gynt, it was much more than simply listening to Grieg’s music on a CD. 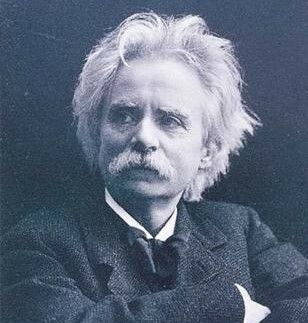 Edvard Grieg, composer of the music for Peer Gynt. The performance was wonderfully crisp, clear, and dynamic. Not counting the three choruses present for the production, there were forty players in the Orchestra (if I counted correctly) and from these forty players the conductor, Keith Clark, managed a marvelous depth and breadth of tone color. To add Norwegian authenticity to the performance, the Ultima Thuhle Choir from Tromsø was present to give vigorous expression to the Norwegian text of In the Hall of the Mountain King and other less familiar parts of the score. As I was listening I was thinking how the theme of In the Hall of the Mountain King belongs to the small number of universally known passages from the classical tradition, like the theme from Beethoven’s Fifth. Jean Sibelius, composer of the Violin Concerto in D minor, Op. 47 that constituted the first performance of the evening. Peer Gynt was the second part of the program, following the intermission. 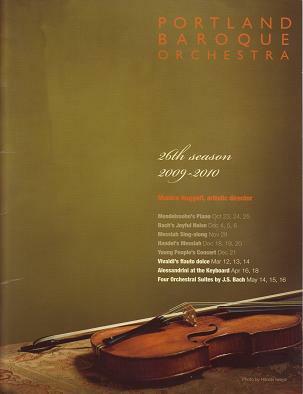 The first part of the program was Jean Sibelius’s Violin Concerto in D minor, Op. 47 from 1903. The soloist was Elizabeth Pitcairn. As soon as she began playing I was struck by the forceful sound of her violin, and I was asking myself, “Is this because of the violin, her performance technique, the performance space, or a combination of all of these?” Reading the program I discovered the Ms. Pitcairn performs with a 1720 Stradivarius — the famous “red violin” that was the basis for the film The Red Violin. 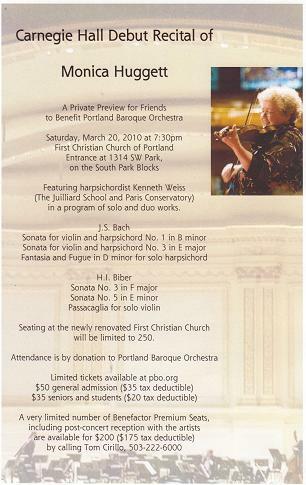 I suspect that it is a rather rare event when a Stradivarius comes to Astoria and my own Clatsop County, and I felt very privileged to be present at such a performance. It may well be the only time in my life I get to hear a Stradivarius live, and I can assure you that the experience is well worth whatever price one might need to pay for admission. Pitcairn played the entire concerto without so much as glancing at a sheet of music. She gave a memorable performance, and the orchestra accompanied her with a sensitive, nuanced, and even delicate performance of its own. 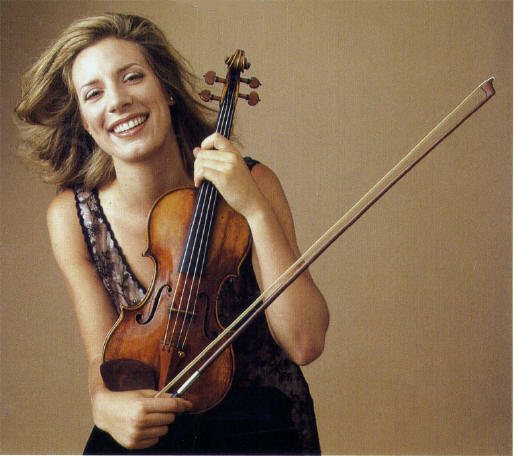 Elizabeth Pitcairn with the famous 'Red Violin,' a 1720 Stradivarius. All-in-all it was an excellent performance and an enjoyable evening. I hope that the Astoria Music Festival will continue to improve its offerings. If it does so, it will not fail to achieve renown and recognition. It was Vivaldi’s birthday ten days ago, and the Portland Baroque Orchestra celebrated with an all-Vivaldi program this evening. A son of La Serenissima, The Most Serene Republic of Venice, Vivaldi was called il Prete Rosso — “The Red Priest” — in reference to the color of his hair, though the most famous portrait of Vivaldi shows him in a white wig as was the custom of the time. I have come to expect the highest performance standards from the Portland Baroque Orchestra, and I was not disappointed. The noted recorder player Matthias Maute was present for the first, second, and last pieces, showcasing these lesser-known works of Vivaldi. For the first two Maute played an alto recorder, and for the last piece he played a soprano recorder. It was also announced that Monica Huggett, leader of the PBO, would be having her debut at Carnegie Hall later this month. 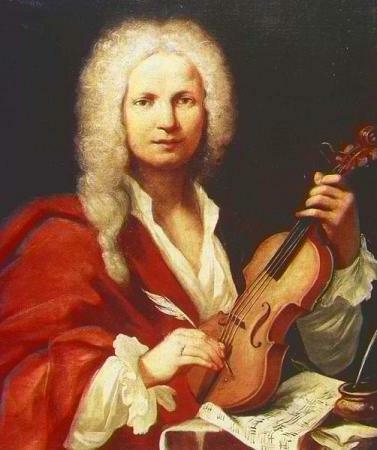 In the Concerto in D major, known as “Il Grosso Mogul,” so named for the exotic “Oriental” character of the second movement, it was explained that a scribe was present at one of Vivaldi’s own performances of this work, and he recorded Vivaldi’s actual cadenzas, which Monica Huggett played tonight. The preservation of these candenzas is quite unusual, and candenzas for this reason have been a disputed point in historically informed performance, since it was known that baroque players were expected to improvise, but so few examples of improvisation were written down for posterity that contemporary players have little to go on, and the performance traditions have largely been lost. As exciting as it was to have this unusual window onto the work of Vivaldi, indeed, onto the actual performance of Vivaldi, the best part of the program was the spirited encore that was not on the program. Matthias Maute said that they would play a Hungarian folk tune from the eighteenth century, and PBO took it up with gusto. It was a lively piece of only a few minutes duration, and very different in spirit from the Vivaldi. It was the kind of music that immediately puts a smile on one’s face. I think I even laughed out loud (quietly) at the sudden contrast between the Vivaldi and the Hungarian folk tune. Lastly, there was a second encore, again only a few minutes in duration (less than five, I would guess, as I didn’t think to time it), and again a sudden contrast in the texture of the music. They did not identify this last piece, for which Matthias Maute played a flute, but it sounded thoroughly contemporary. I would not be surprised if it was something composed by Maute himself. These final two encores alone were worth the price of admission and left me feeling very happy that I had attended. 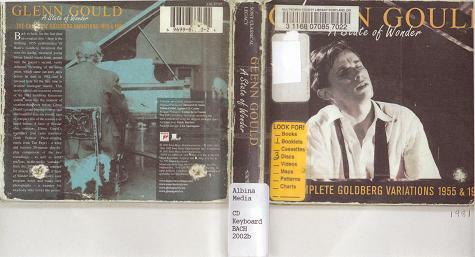 Several days ago at the library I checked out Glenn Gould: A State of Wonder, The Complete Goldberg Variations (1955 & 1981). I have checked this out previously, and I really should find my own copy as I enjoy it so much. I’ve listened to all of it every day (both discs, the 1955 recording and the 1981 recording) since I checked it out. The version of the impatient young man in a hurry runs a little over 38 minutes; the more meditative version of Gould’s older self, repeating some favorite variations and playing more sedately, runs to a little over 51 minutes. That’s almost fifteen minutes’ difference in two versions of the same score. Today Gould’s work appears a little Quixotic. At the same time as the historically informed performance music was getting started in the middle of the twentieth century (Thurston Dart published his The Interpretation of Music in 1954), Gould made his famous recording of Bach’s Goldberg Variations on a piano, not a harpsichord. Some harpsichord music performed on a piano sounds downright strange, if not plainly wrong; it is not always a pleasant experience to hear such an effort. That Gould’s effort sounds as good as it does is a measure of his artistry. Gould’s Goldbergs are an interpretation in the best sense. 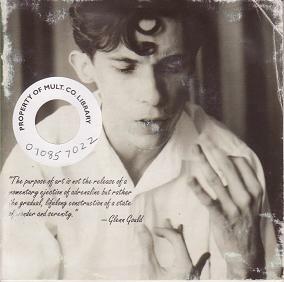 Quixotic though it is, Gould’s Goldbergs still pulse with life, the 1981 version no less than the 1955 version. Already the more “recent” recording is close to thirty years old. The music itself is more than 250 years old, and perhaps we should note this as well when we note that the music no less than the performance pulses with life. It is the clockwork life of the Enlightenment, the same sort of clockwork that Paley in his famous work on natural theology employed in a classic formulation of the design argument. Bach’s superior artistry, like the superiority of Gould’s artistry, is in evidence from his effortless ability to take this baroque clockwork and transform it into something transcendent. 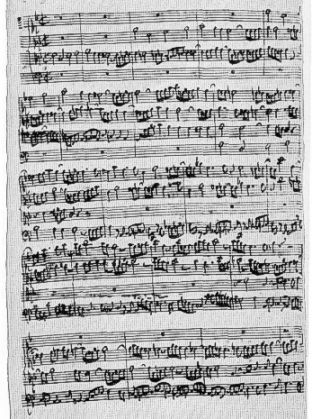 When we recall that Pergolesi lived and died young (and wrote his Stabat Mater) all before Bach died, and accomplished something so different at the same time, it can give us a feel for what Bach accomplished. 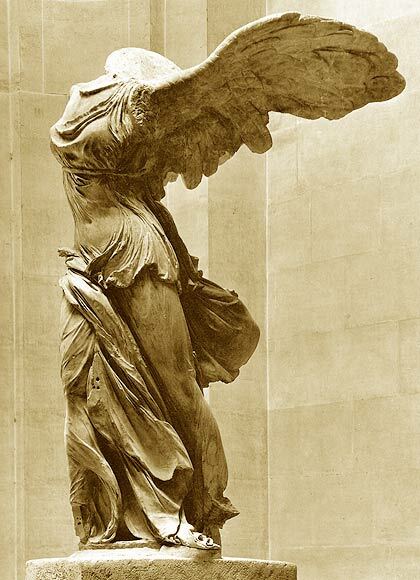 All of the examples I mention below are musical, but I also experienced what it is like to behold in the presence of the Nike of Samothrace. Near the end of Music, Mathematic, Phenomenology I made an observation to the effect that early modern vocal polyphony constitutes, “a particularly systematic and thorough method for attaining to a consciousness in which the music that one hears ‘disappears’ in terms of any utilitarian or instrumental presence and becomes something that can only be beheld.” This is not the happiest formulation I might have arrived at, but I realized as soon as I wrote it that there is something of importance in the thought, however imperfectly expressed. I find myself once again groping toward an adequate formulation for which I do not yet have the right words, and I beg the reader’s indulgence in following me so far as possible in this context of discovery, knowing how different it can be from the context of justification. What is important in the above formulation is the emergence of what it is to behold as a category of perception and, more importantly yet, as a category of thought. What is it to behold? What is it to be beheld? What is beholding? Has beholding ever been properly the focus of philosophical analysis? if not, it certainly should be, for it represents a unique, sui generis relation to the world, or, rather, to the object that is beheld. I‘ve started my research into what it is to behold by skimming some of my philosophical dictionaries. There is nothing in Antony Flew’s Dictionary of Philosophy (Revised Second edition), nothing in Mario Bunge’s iconoclastic Dictionary of Philosophy, nothing in The Cambridge Dictionary of Philosophy edited by Robert Audi, nothing in the old Runes Dictionary of Philosophy: Ancient-Medieval-Modern, nothing in the Edwards Encyclopedia of Philosophy (neither article nor index), nothing in The New Dictionary of Existentialism from St. Elmo Nauman, Jr., no index entry on “behold” or any cognate in A Dictionary of Philosophical Quotations edited by A. J. Ayer and Jane O’Grady, nothing in the index volume of the Dictionary of the History of Ideas. Are you noticing the pattern that I’m noticing? The next step would be to start looking in the indices of a more broadly-chosen sample of philosophical works. Perhaps I might find something in the philosophy of religion, but my personal library is pretty thin in that area, so it will have to wait until later. 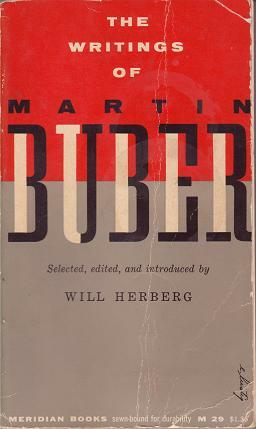 I have, next to me, an old paperback copy of The Writings of Martin Buber (edited by Will Herberg), and it strikes me at the moment that there is something of the I-Thou relationship in the experience of beholding. Reading a few pages into I and Thou I can find many suggestive quotes, such as, “The Thou meets me in grace — it is not found by seeking.” So far, so good. But then Buber writes, “The Thou meets me.” Well, what I understand so far about beholding, as I conceive it and as I experience it, does not involve the beheld object as meeting the beholder. One of the paradoxical things about the relationship of beholding is that it is clearly a two term relationship — x beholds y, as it were — but it is not a relationship of any kind of reciprocity. In the language of the logic of relations, x beholds y doesn’t seem to exemplify any of the usual categories, but does not necessarily escape these categories either. We cannot rule out symmetry, as the object we behold may behold us in turn, but we can’t count on it either. Similarly, we must acknowledge the possibility that one might behold oneself, making the relation of beholding possibly reflexive. The relation of beholding does not seem to be transitive, as it seems unlikely to hold that if I behold x and x beholds y, then I will also behold y. Possible, yes, but not likely. I started thinking about beholding as a result of listening to Monteverdi’s madrigals, specifically Book VI. I just now finished listening to Beethoven’s Quartet No. 14 in C sharp minor, Op. 131. 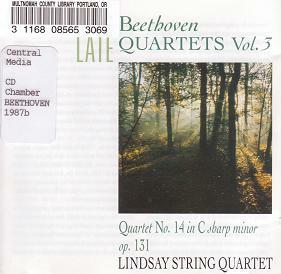 Beethoven’s late quartets are profoundly meditative works, and one must bring considerable powers both of concentration and reflection to one’s listening. I cannot pretend that I do justice to Beethoven’s quartets. But as soon as I say, “one must bring…” I am acknowledging that, whatever the profundity of Beethoven’s late quartets, the listener can in fact bring something to them. The difference here is that one can bring nothing to the great works of early renaissance vocal polyphony. Thus one brings nothing to the relationship of beholding. The object that is beheld thrusts the beholder out of the causal order. As long as one beholds, and to the extent that one beholds, one can do nothing except behold. For this reason I compared the experience of beholding to the phenomenological epoché, because it would appear that both involve a suspension of the natural standpoint and a turn away from any consideration of existence. Both exemplify an anti-ontological stance. But what is otherwise than being (to borrow a phrase from Levinas) is difficult in the extreme to characterize in any thorough, systematic, or rigorous way. But this is at least one thing that makes the music of Claudio Monteverdi, Luzzasco Luzzaschi, Michelangelo Rossi, and, certainly not least, Palestrina so astonishing: it is thorough, systematic, and rigorous. Like Husserl’s rigorous method for attaining an intuitive grasp upon the world, music also constitutes a rigorous method for attaining intuitions. Paul Klee wrote in his Credo, “Art does not reproduce the visible; rather, it makes visible.” (“Kunst gibt nicht das Sichtbare wieder, sondern macht sichtbar.”) In the same spirit we can say that music does not reproduce the audible; rather, it makes the audible. And, in a sense, in so far as it makes the audible, it makes the world… if we will but listen with the mind’s ear. I can easily imagine writing an entire treatise on the attitude of beholding; it is a concept that suggests a wealth of exposition. 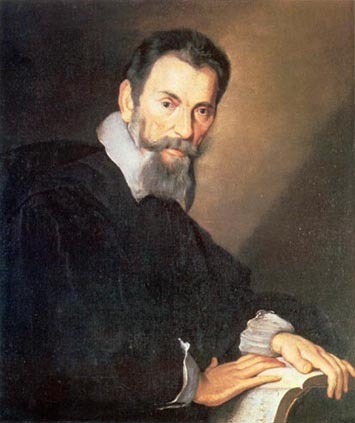 Monteverdi's ethereally beautiful music has been an inspiration for me to consider the ontological status of his music. The formality of music and the aesthetic dimension of mathematics have long been parallel themes. There are many wonderful quotes from the literature of music to this effect. I quoted several of my favorites in Algorithms of Ecstasy, which I encourage the curious reader to peruse. Bach's Die Kunst der Fuge. 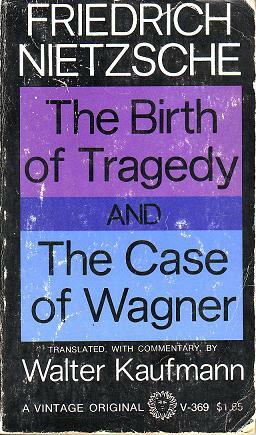 I have long thought that Die Kunst der Fuge is not unlike L’Art de Penser. Music is a formal language, but it is also more than this. I see in both music and mathematics the same dialectic of the formal and the informal. The sensuousness of music blinds many to its formal elements. When Schopenhauer said that music is the pure language of the will, unmediated by representation, free of the forms which dominate the other arts, he obviously was not thinking of the formal rules of composition. The industriousness with which Bach develops and exploits a theme through counterpoint, inversion, retrograde, and retrograde-inversion has more to do with the intellect than with the will. A more recent example of composition as an intellectual exercise is afforded by serialism. In contrast to the sensuality of music that often blinds us to its formal elements, the abstractness of mathematics blinds many to its non-formal, intuitive elements; although, for example, axiomatics (a distinctively mathematical mode of thought at least since Euclid) forces us to recognize the intuitive foundations of any mathematical theory right from the start, with its primitive terms, axioms, and rules of inference which must be accepted in order to begin. However, after this intuitive foundation, all that follows is formal, and it is the formality of the axiomatic method which is widely understood to be it distinctive contribution to mathematical thought. 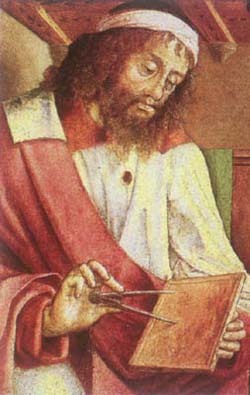 Euclid provided the model of formal thought with his axiomatization of geometry. The Greeks were eminently suited to unfold formal reasoning to the world, given their preoccupation with the virtues of limitation, finitude, order—peras. 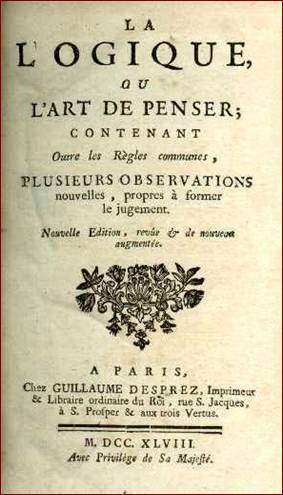 Indeed, those qualities which shared the right side of the Pythagorean table of opposites with peras—all that is sharply and clearly defined—represent all of the properties upon which mature formal systems have converged. 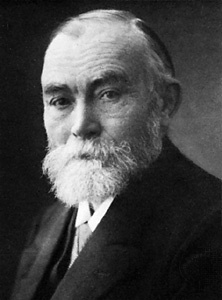 When logical thought at long last began to catch up with logical practices Frege gave eloquent expression to these same concepts necessary to the development of formalism: “rigour of proof, precise delimitation of extent of validity, and as a means to this, sharp definition of concepts.” (Frege, Foundations of Arithmetic, § 1) While intended as an assertion of the demands of formal thinking, it could also serve as a formalist aesthetic manifesto. If Frege had been interested in aesthetics he could have written the manifesto of the formalists. Both mathematics and music are developed with the same eye to aesthetic purity, and as such they stand, more than many human endeavors, outside the causal order, a little bit outside the world, outside existence. Thus it ought to be natural to approach mathematics phenomenologically, suspending the world through the epoché, disregarding existence. And yet I have not read anything which considers what I think are the genuine issues of a phenomenological philosophy of mathematics. The heavily ontological nature of most contemporary discussions in the philosophy of mathematics — Are numbers objects? Do they exist? etc. — is a preoccupation which prevents a phenomenological perspective from being heard. 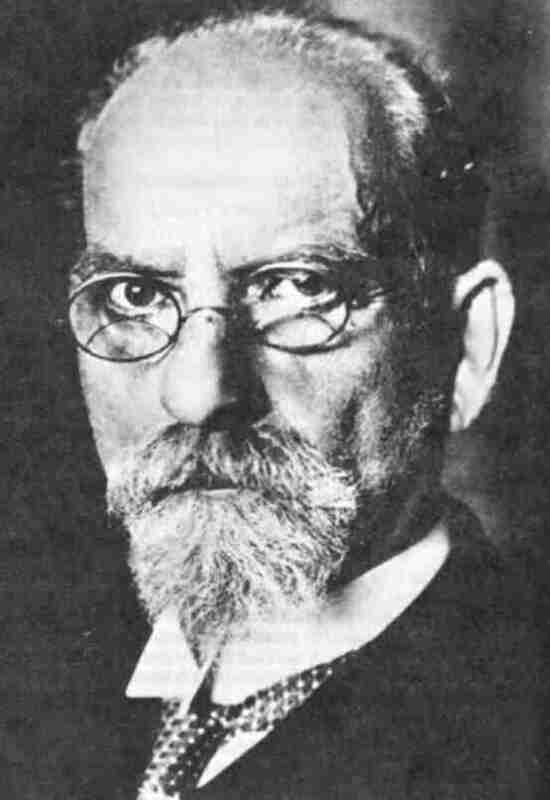 Edmund Husserl was no more interested in aesthetics than Frege, though there are potential applications of phenomenology here as elsewhere. Suppose we interpret the epoché as the suspension of any consideration of existence, that the natural standpoint naively assumes the existence of familiar objects and these unthinking judgements are precisely those which need to be set aside: what then remains of today’s ontological philosophy of mathematics? Very little, I think. Let us approach a phenomenological philosophy of mathematics taking the epoché seriously, and defining it in some way which does not involve us in disputes as to the possibility of having some kind or other of subjective experience (i.e., we need to avoid allowing the epoché itself to be a problem). By this I mean that we need some kind of formal or quantifiable definition of the epoché, and here I will simply take it as ruling out any reference to existence. Thus traditionally troublesome issues in the philosophy of mathematics, such as whether sets exist, are ruled out from the beginning. The question which has so vexed formulations of the axiom of choice — whether there exists a set which consists of an infinite number of members, each element taken out of an infinite number of sets — cannot even be a question in a phenomenological context. One cannot “sing along” with a Monteverdi madrigal. One cannot even tap one’s toe in time to the music, or sway one’s body to the rhythm. Such gestures are futile and inappropriate. One must listen only. One must become an ear, nothing but an ear — a pure auditor. 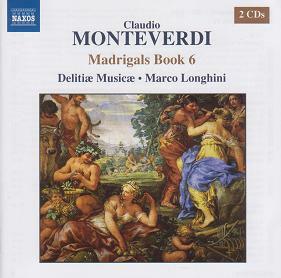 Monteverdi’s madrigals hold the auditor at a distance even while enveloping him in layers of vocal textures. I could have said that Monteverdi’s late madrigals lack any instrumentality whatsoever. There is nothing that we can do with them, no “purpose” (in the vulgar sense) to which they can be used. With such music there is a complete absence of readiness-to-hand (to employ a Heideggerian turn of phrase — and hopefully more on this at a later date). Another way to formulate this unique character of the music would be to say that the character of the music itself forces the auditor into an intellectual position not unlike the phenomenological epoché. Indeed, the music itself could be taken as a method of the epoché, a particularly systematic and thorough method for attaining to a consciousness in which the music that one hears “disappears” in terms of any utilitarian or instrumental presence and becomes something that can only be beheld. To hear such music is to forget the name of the thing one hears.